FVP10 has a built-in USB interface. Parallel , Serial & Ethernet interfaces are optional. TSP100U & TSP100IIU are only USB interface, TSP100LAN is only LAN interface. TSP650 / TSP650II / TSP700II / TSP800II / SP700II can select either parallel, serial, USB or LAN interface. All interfaces are fully bi-directional. TSP400, SP300 has optional RS422A interface, but other models don't have RS422 interface. Serial printers cannot use Raster drivers. Serial port communication is too slow to utilize raster drivers. You can always purchase a parallel or USB interface for the printer to make the printer compatible with raster drivers. In case of larger data printing such as image data printing, middle area of the printing will not be printed. Normally, Xon/Xoff is default setting in Windows, but Star's default handshaking is DTR (hardware) communication setting. It can be changed by DIP SW. It depends on the reset signal status of PC. Some of general PC keeps low level of output of reset #31 when LPT port is closing. To avoid this phenomena, you can set external reset to be invalid by DSW 1-5(TSP600/650/700/700II/800/828L/1000) or MSW6(SP700 & SP500). Please connect to PC as following assignment. The arrow shows the data flow direction. Please pay attention the cable. It should be "cross cable" . DTR mode is so called "hardware handshake" . In the DTR mode, the DTR signal is used as a BUSY signal for printer control. A SPACE indicates that the printer accepts data, but a MARK indicates that the printer rejects data. If there is no error after the power on, the DTR signal line changes to "SPACE" . 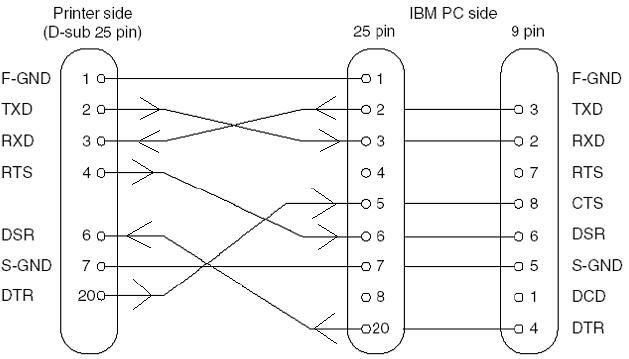 When the host confirms that the DTR signal line is set to "SPACE" , the host sends the data text via the RXD signal line to the main logic board. Also, the main logic board will set the DTR signal line to "MARK" . When the printer is ready to receive data, it periodically sends an X-ON (<DC1>=11h) signal to the host. When the printer is not ready, it sends an X-OFF (<DC3>=13h) signal to the host. In case of Xon/Xoff mode, printer doesn't check the DSR status to send a data to host. All USB devices are identified by the operating system (such as Windows XP) using a unique serial number. Some hardware will have specific serial numbers built-in by the manufacturer, but most do not. In the case that a device does not provide its own serial number, one is provided by the operating system when the device is connected. STAR Printers supports both options as both have advantages and disadvantages, and either may be the most suitable for a particular customer. If STAR Printer is not manually assigned a USB serial number, it accepts the serial number of the USB port it is connected to. When it is removed from that port and plugged into another, Windows recognizes it as a different device. For example, if a TSP100 is installed on USB001 and later plugged into USB002, Windows will automatically reinstall the driver because it sees it as a new printer. STAR has developed a utility to manually assign a USB serial number. This results in the OS always recognizing the printer, regardless of which USB port it is plugged in to.